In the autumn of 1994, alternative rock was still very much the dominant sound on modern rock radio. It was the year of Pearl Jam’s Vitalogy, Soundgarden’s Superunknown, Nine Inch Nails’s Downward Spiral, and Alice in Chains’s Jar Of Flies. R.E.M. embraced crushing distortion on Monster, Smashing Pumpkins, Stone Temple Pilots, Rollins Band, and Meat Puppets released popular discs, and Nirvana exited the stage to the elegiac strains of unplugged guitars. So-called “Britpop” blew up with the début album from Oasis and Blur’s Parklife. Thanks to a mud-caked appearance at Woodstock ’94, Green Day became the tip of the pop-punk spear that would soon become very popular. 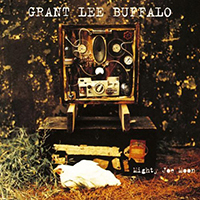 Completely unobserved amid the crashing guitars, a trio named Grant Lee Buffalo released their second album, Mighty Joe Moon. Their first, Fuzzy, had been a hit with critics and other musicians. R.E.M. in particular were huge, and vocal, fans. Because of this, and thanks to being given the opening slot on R.E.M.’s worldwide, and jinxed, Monster tour, Mighty Joe Moon became the band’s most successful album. Their (not very good) video for “Mockingbird” was played on MTV a handful of times (Beavis and Butthead critiqued it at one point), and there were the occasional late night TV appearances. But calling it their most successful album is faint praise. In the public consciousness, the album came and went without a trace. Mighty Joe Moon was too different from the musical zeitgeist. A lush, densely layered, largely acoustic album, enriched with Dobros, pedal steel, mellotron, banjo, all manner of percussion instruments, and even a pump organ was a far cry from the Who-like storm of Pearl Jam or the psychedelic metal of Soundgarden. To be sure, there were moments of alternative rock fury, most notably on the bruising “Lone Star Song”, where singer/songwriter Grant-Lee Phillips deftly mingles the stories of Kennedy’s assassination and the more recent fiasco at David Koresh’s compound in Waco. But even here, riding atop the slabs of guitar chords, the musical hook comes from a harmonica…not exactly the most commonly heard instrument at the time outside of the confines of a Blues Traveler song. Over twelve more songs, Phillips, bassist Paul Kimble, and drummer Joey Peters travel the back roads of America. They sing of eating trout in the Cumberland Gap (“Mighty Joe Moon”), of Johnny Cash singing for pills (“Demon Called Deception”), of the airplanes flying high above Tecumseh’s grave (“The Last Days of Tecumseh”), and of the devastating aftermath of the 1994 earthquake in California (“Mockingbirds”). American icons like Evel Knievel and Muhammed Ali show up alongside villains like John Wayne Gacy (“Sing Along”) and characters from myths and folktales (“Lady Godiva and Me”), before the album closes with a beautiful, heartfelt prayer and plea for forgiveness (“Rock Of Ages”). The music is folk and rock, country and alternative. Nobody was calling it “Americana” back then, but that’s exactly what it is, and it puts the biggest names in the genre to shame. This is what an alternative rock version of The Band would sound like, with Phillips’s magnificent tenor and sweeping falsetto (Rolling Stone‘s Annual Critics Poll named him Best Male Vocalist in 1994) replacing Levon Helm’s down-home grit and Richard Manuel’s keening heartbreak. The album sold a bit more than 100,000 copies, roughly equal to the total sold by Grant Lee Buffalo’s three other, excellent, albums combined. Those sales numbers don’t reflect quality, and Mighty Joe Moon stands as one of the best albums of the decade that spawned it.